Former first lady, Patience Jonathan, has asked the Federal High Court to set aside the court order granted on May 30, 2017, freezing 16 of her accounts in different banks. 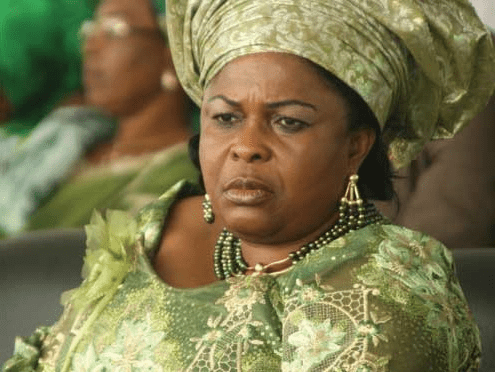 The Economic and Financial Crimes Commission (EFCC) has told a Federal High Court in Abuja that the property linked to former First Lady, Patience Jonathan has been fraudulently acquired. Patience Jonathan had filed a fundamental rights suit before the court demanding the sum of N2 billion against the EFCC accusing the anti-graft agency of harassing her. Counsel to the EFCC, I. Abdul yesterday tendered four exhibits linking Mrs Jonathan with the said property and asked the court to dismiss the suit for being unmeritorious. He also refuted the claim by Mrs Jonathan’s counsel, Ifedayo Adedipe (SAN), that the commission was in abuse of court process by filing an ex parte for the interim forfeiture of the said property, while aware of the suit. After taking the submissions, Justice John Tsoho fixed December 8, for judgement. Similarly, Justice Binta Nyako has set November 23 to hear an application by Mrs Jonathan seeking to set aside the court order of May 30, 2017 freezing 16 of her accounts with different banks containing, $5.8m and N3.5bn on the grounds of time lapse. In the application, Mike Ozekhome (SAN) told the court that the orders of interim forfeiture including a subsequent one issued on October 10, 2017, have become spent and cannot be extended. But EFCC counsel, Richard Daudu, urged the court to hear his application which seeks to extend the forfeiture order.